When we talk about training, getting better, or even life itself, we HAVE to talk about our mindset. Our mindset dictates a lot of our training before it even happens. For example, if you have low self confidence and a bad attitude, then when you confront a new weight on the bar and go for that new PR, you're going to be doubting yourself before you even touch the weight. As you rack the weight on your back, your doubts begin to make the bar feel even heavier than it is. When you go for your lift, you fail out. Your mindset defeated you before you ever started. You probably have experienced this outside the gym as well. You may have had a particular romantic interest who you were never confident enough to ask out. You may have had a job opportunity that you were too scared to inquire about. You may have been too afraid to tell the gym-bro curling in the squat rack to stop hogging the squat rack because you actually need to do legs! In all of these situations, your mindset is stopping you before you even get started. But that can be change. And the benefits to changing that are huge. We tend to believe that when we are successful, we will be happy. Actually the opposite is true. Happier people are more successful. So if you want to achieve your goals, start being happier. More optimistic people survive better and are less likely to die in cases like disease. Sounds like another reason to fix your mindset. Did you know that people who are more positive are more likely to find better opportunities? This was studied and found that people who were stressed and sad were less likely to notice opportunities than happier people with better mindsets. So we are looking at more success, more happiness, better health, more opportunities, more gains, and better at just about everything we could ask for in life? Why WOULDN'T we want to have a better mindset if there are all these gains to be had? 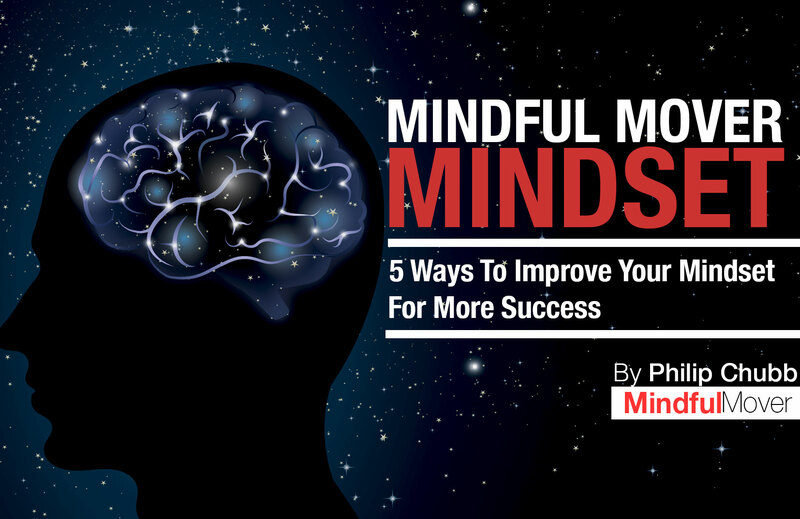 With that in mind, we worked on the Mindful Mover Mindset which is a collection of techniques we learned from many great researchers in the fields of success, happiness, and positivity. How Do We Change Our Mindset? Many of us aren't fully happy and as we said earlier, happiness comes before success, not the other way around. So to develop happiness, we need to learn how to actually be happy in the first place. In the book "The Happiness Advantage" by Shawn Achor, there are many tips proven by science to improve your happiness. This happiness helps increase your quality of life and success as a result! How many of us are pessimistic? We tend to be pessimistic because we don't like being disappointed. We can't be disappointed if we always expect things to go wrong. Makes sense, right? But sadly, it doesn't make gains. As humans, we can make better gains and improve our health by being more optimistic. There are three key things that determine if you are optimistic or pessimistic and the good news is that those three things can be changed. They are Pervasiveness, Permanence, and Personality. The book "Learned Optimism" by Martin Seligman goes into these in detail and shows you how to become more optimistic. There are two kinds of mindsets people have when it comes to talent: fixed and growth. Fixed is when you believe your talent is capped. You performed well on the test because you are smart and you performed badly in the game because you are not athletic. A growth mindset is where you believe you can change based on hard work. You can become smarter AND more athletic because you are willing to work hard and improve yourself. When you are willing to work to improve, you are more resilient against moments that would normally hurt your ego. A bad grade on a test doesn't hurt as badly because you know you can IMPROVE and get better. The book "Mindset" by Carol Dweck is a great resource into this. As humans, we tend to notice the bad more than the good. It makes sense why. There's a lot for us to remember and it's important to remember what can hurt us so we can avoid it. For example, don't punch bears in the face. That ends up badly for us. However, this attitude often doesn't shut off and we take it home with us. Our spouse makes one mistake and we immediately notice the bad rather than the ten things they did well that day. Now they're upset and we're upset and no one is happy. But by training ourselves to notice the good, we can change that and become better and more positive people. And even better, others will want to be around us because we point out and bring out the good in them. There is a GREAT passage on this topic in the book "59 Seconds" by Richard Wiseman. 5. Learn the idea of Kaizen. Kaizen means "continuous improvement". We learn to get better just a little bit each day. The goal here is to not feel like we have to get better all at once and not feel inadequate when that doesn't happen. Instead, we want to improve ourselves day in and day out. After a few days, we have started a new habit. After a few weeks, we are solid. After a few months, we are much improved. After a few years, we are amazing! But it's because we understood that we don't have to become amazing overnight. We understood that it takes time. A great book for learning this is "Mini-Habits" by Stephen Guise. With these 5 changes, we can adopt a whole new mindset and achieve more success, happiness, and gains in life and live our lives to the fullest that we can! Start down the list and get to improving your mindset today! Subscribe below to get regular updates from Mindful Mover. Copyright © 2019. Mindful Mover - Philip and Martina Chubb.